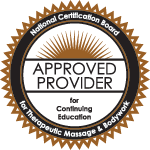 Elaine received her New York State license in massage therapy in 1978. She began working with pregnant women early in her career and developed a professional training course, “MotherMassage: Massage During Pregnancy” in 1990. This course provides professional certification to massage therapists, childbirth educators, nurse-midwives and doulas in prenatal massage, labor support massage and postpartum recovery care. Trainings are offered at massage schools across the country. Elaine has authored several books, including “MotherMassage: A Handbook For Relieving the Discomforts of Pregnancy”, “The Encyclopedia of Bodywork”, “Prenatal Massage: A Textbook of Pregnancy”, and “Modalities for Massage and Bodywork”.